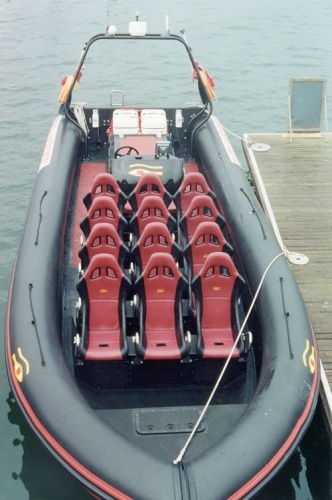 RibEye 10.5 mtr black Hypalon RIB Tubes with red stripe above and below the big D rubbing strake ,inboard diesel with waterjet and fitted with 12 rally car seats for paying passengers. 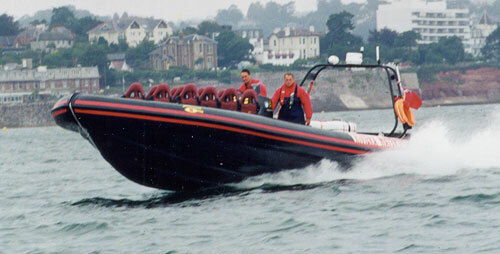 Ribeye workboat used for taking paying passengers on thrill rides round the bay and for viewing sealife around the coast. Tilley Inflatables RibEye RIB repair services, RIB Retubing, RIB Retube using Hypalon Fabric, RIB Tube Replacement, RIB Tube Repair, RIB Refurbishment, Seat Re-upholstering. We aim to be very competitive on rib re-tubing cost so please contact us for a no obligation retube price quote for your RibEye RIB.